Wow, I love the mix of patterns and the scarf is amazing! Love the fold of that scarf. Great dark chocolate brown color, its really a color that says 1970's to me. Pretty fun though. I want to be there now! The pattern combo works and that Goyard is phenomenal. 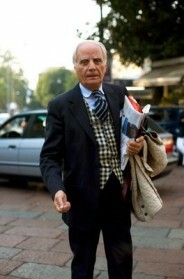 his scarf is fabulous and i love the mix of prints – great look, great snap! This shot is GREAT! The mix of patterns and not to mention his killer smile. The outfit is great, but the personality is even better! Oh my word he is adorable! That giant smile really completes the look. The mix of prints is great. Sorry, but the mix of patterns is ill-advised; a perfect example of more not being more. But that scarf is a real winner, as is the way he has tied it. Nice. Now thats more like it Sart! 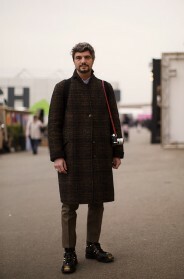 Love the images from Pitti. Thoughts go out to all our Japanesse friends. Florentines are the best dressers in all of Italy I tell you. They are so stylish and chic..loves this look fantastic. Elegant. Texture, color, pattern all perfect, right down to the pocket square. That is a nice combination. Oh now…this is just awesome. great smile too! Just that he´s happy makes it! Fashion or not! i guess when you mix with similar color patterns the results are successful! Oh this is delightful! I love his scarf! And people just need to smile more in general… but I guess that's the American inside of me speaking. so cool! asians are amazing! Love it mix it up! This is kamoshita-san, the best dressed man in asia! l do like the mixing patterns, l think is it so awesome…. l love it.. ! ! ! Now there's a man who can rock a neck scarf! I love the suit, and he looks joyous. Love how the scarf stands out. what a beautiful mixture. i love these pictures. That scarf, his suit, Goyard, and smile is a classic match. Where can I get that bias-cut scarf ?!!! God! — I LOVE IT ! love the mix of patterns in this look. very classy style! I adore the mix of pattern! And his happy face honestly makes everything look even better! Great shot! This is amazing! A man dressed well having a great time it seems. We need to see this kind of stuff more often! Ok, that's just ridiculously adorable. As is he. He's in pattern heaven, and we're all pressing our noses against the pearly gates. This is special! That's just wonderful! What a cute man. Love this mix-up of stripes and plaid. Even the Goyard bag becomes part of the mix. Great SMILE & great STYLE. Love it. Brings me back to a time when all men could dress up. It makes me wish I was born in another time. What a great conglomerate of patterns. Truly dapper. Wow, perfection… really like him a lot. The colours are perfect for a guy who wants to look stylish. The red striped scarf definitely brings much attention to the face, and balances out the look. Its great. I wish he were just wearing a pair of nice slacks. But still, I think the mixing and matching of patterns works really well here. I love his outfit, but my favorite of his accessories are his wonderful freckles! Damn near perfect. If I had to find a fault, it would be the Goyard bag. Perhaps it's the tipping point of one pattern too many. But I'm picking nits, he's killin' it. Love his outfit! It's so original! Made me smile. The color palette is great! I like the stripes in the shirt which subtly play off the larger stripes in that great scarf. Plus he remembered the pocket handkerchief. Well dressed and easy on the eyes. What else can you ask for? Nice shot, Scott! Your photography – capturing the moment – is above the rest. There is no imitation in your work. Good stuff. I know that its not necessary to spend a lot of money to have style, but to wear nice, well cut suits on a daily basis (even if one wears them repeatedly during the same week; changing out shirts and ties) is difficult to pull off. First, need to have a few suits in different fabrics for changing weather conditions. Need a topcoat. Need some tailoring. shoes. shoe maintenance. possibly a belt and bag that matches the shoes. It can be done, but, at least for me, money is a big obstacle, even though I do a pretty good job of value shopping and no longer invest in trendy casual wear. This photo exudes joy. I love the scarf! I love a man in a great suit. His is fantastic. I love the scarf with it, but more than anything, I love his smile. He seems to love life. Is that an Italian thing? He looks fabulous, I love the suit and scarf. But honestly, I just want him to smile at me. The japanese can make a thousand dollar outfit look humble. And im sur the other way around just as easy! What a great face! I sometimes just get caught up in the people rather than the outfits on this blog. Love it! What a very smart look..
Look is very constructive, with a touch of stylish class. awesome. Love the way he wore the scarf. Here I was thinking too much patterns is bad. 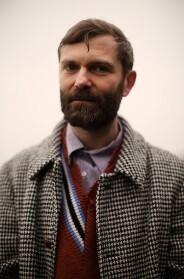 But this man pulls it off well. A very smart look. I love any kind of dapper debonair dandy-ness! yes! great shot, the scarf falls perfect in lined! Looking mighty pleased at being shot isn't he? Well, his mix of checks and stripes truly deserves the attention. Good eye.